The race is on! So buckle up and prepare to cruise into the fast lane with Mecca Bingo, to win one of four brand new, super cool Fiat 500s! Luckily for you, you can step on the accelerator and fast-track your way to big wins, with Mecca's Win a Car promotion! That's because Mecca has four super chic Fiat 500 cars up for grabs! These chic, compact Fiat 500s are oozing with Italian style and grace, and are ideal for cruising around the city! They also make the perfect stylish accessory and are handy for squeezing into all those impossibly tight parking inner-city spots! To be in with a chance of winning the perfect city slicking Fiat 500 car for yourself, simply cruise over to ‘My Account' and the to ‘My Bonuses’ section and use the code WINACAR! Then all you have to do is top up your account with £10 to play any game you fancy playing, from bingo or slots! Each time you spend another £10, you can earn a ticket to the super cool prize draw! The promotion is running until Sunday May 1st, so the more adrenaline-rushing games you play, the more chances you'll have of scooping one of the four Fiat 500 prizes! 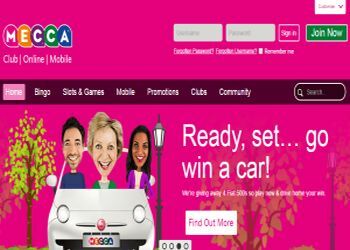 You can check out Mecca's latest Win a Car advert here! But hurry, make sure you join the race to win one for yourself!